Pacific Standard Time: LA/LA is a Getty-led collaboration between arts institutions across Southern California which explores Latin American and Latino Art as it relates to Los Angeles. In addition to more than 70 museum exhibitions, many galleries are participating in the initiative. Here are a few that feature photography. For a complete list visit pacificstandardtime.org/en/gallery-exhibitions/. Please check gallery websites for exhibition dates. Alejandro Cartagena, Santa Barbara Return Jobs back to US or the Collective Memory of the Worst Place to Live in the World Today If You Are Not White, 2017. Santa Barbara Return Jobs to US or the Collective Memory of the Worst Place to Live in the World Today If You Are Not White is a presentation of new work by Alejandro Cartagena that peels away at the immediate beauty and presents new impressions of the coastal community of Santa Barbara, California. During a residency in Santa Barbara, Cartagena was interested in how the perception of Santa Barbara had been previously constructed in the mind of the outsider. Was Santa Barbara a college town and site of school shootings? Or a Hollywood haven for Oprah Winfrey and other stars? Though on the exterior this small tourist town seemed the picture-perfect American-Mediterranean escape, just under the façade seemed to lay something uneasy. Santa Barbara is Cartagena’s explorations of a narrative that that can only be felt from the outside. A group exhibition curated by Alejandro Cartagena of six contemporary Mexican photographers as part of PST LA/LA. Participating artists Aglae Cortes, Fernando Gallegos, Juan Carlos Coppel, José Luis Cuevas, Karla Leyva and Mariela Sancari. In Tell Me a Story: Contemporary Mexican Photography, Curator and Mexican photographer Cartagena presents an examination on the breadth of styles and subjects that are being addressed today in contemporary Mexican photography. From the personal to the public, and from the industrial urban city to the northern farmlands of Mexico, these six young creators are exploring the possibilities of the medium and how to address the current social and political situation of a country in crisis. The exhibition includes traditional photo based works and PST LA/LA site specific installation pieces. 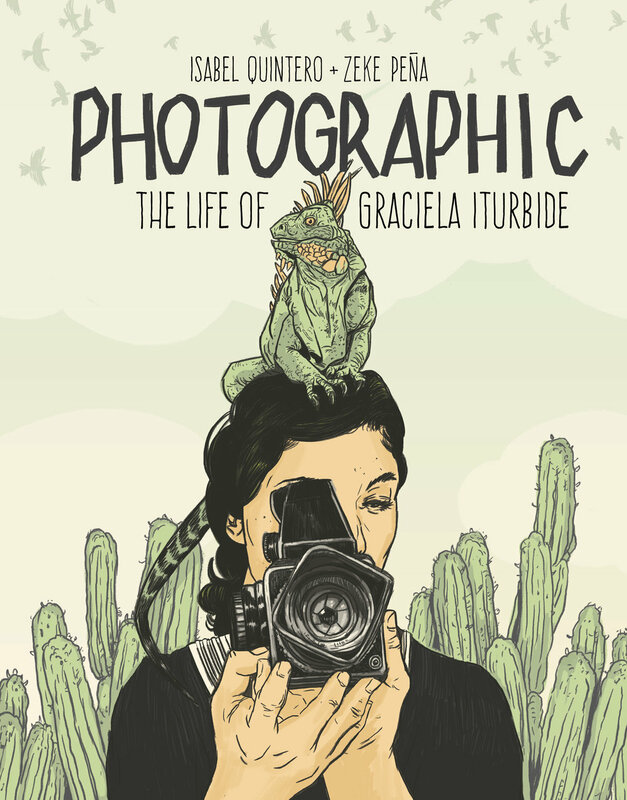 PhotoGRAPHIC is an exhibition of the graphic novel PhotoGRAPHIC: The Life of Graciela Iturbide, published by J. Paul Getty. Accompanying works by the legendary photographer, ROSEGALLERY will present the novel in its entirety, with original drawings by Zeke Peña and prose by Isabel Quintero. Photographs, illustrations and prose come together to illuminate the artistic power of Iturbide’s life and work. Gianfranco Foschino is a key figure in a new generation of artists from Chile. He has developed a body of work that blurs the lines between cinema and photography. The South Gallery features a series of landscapes that the artist recorded on video by setting up a fixed camera and capturing the subtle movements that occur in front of the lens. Filmed from a distance, the scene increases in intensity as the minutes pass by with no sign of the narrative we have come to expect from video. Referring to historical precedents of early video art where the emphasis was on documentary and time, Foschino’s works engender us to pause and be present, to unplug and reconnect with our senses. Lucia Koch uses interventions, installations, videos, and photographs to explore the means for affecting change in one’s experience of the environment. Koch has become known for photographing the empty interiors of small boxes and bags and enlarging them to architectural scale. Without making any modifications to the object, Koch photographs ordinary containers as they exist in everyday life. Once enlarged, however, the photograph functions as an extension of the physical surroundings, situating the viewers into the photograph's space and altering our perception and perspective. For this exhibition, Koch presents a series of new photographs of box interiors that have distorted, non-orthogonal shapes. The same boxes have been photographed under slightly different lighting conditions to reveal distinct movements between them. Through the viewer’s experience of these similar, repeated shapes, the time-related nature of the work is revealed. Miguel Rio Branco is renown for his use of color and the richness and complexity of his subject matter: direct, often brutal photographs of Brazilian society. His project Out of Nowhere is a documentary about the famed Santa Rosa Boxing Academy in Rio de Janeiro, named for the devotionally extravagant patron saint of Central and South America, and this show features a series of images of the boxers at the academy. In the words of David Levi Strauss, Rio Branco’s colors seep out of their borders like bodily fluids, staining and contaminating everything around them. Bodies, bindings, wounds, and walls are wet with color. The photographs reflect Rio Branco’s notorious sensuality and exuberance in their light, drama, and pathos. Christina Fernandez: Prospect features two new bodies of work, View from hereand reflect/project(ion). Her new work continues several threads present in her earlier series, with a renewed formal clarity. Ideas regarding place, history, memory and legacy are strong currents within the exhibition. View from here is an ongoing series of ten photographs, depicting various windows and their views onto the exterior surroundings of a particular structure. The accompanying series reflect/project(ion) is a group of collaborative photographic portraits printed on stretched canvas. Ken Gonzales-Day: The Bone Grass BoyBone-Grass Boy, begun in 1993 and debuted in 1995, was Ken Gonzales-Day’s first major body of work after completing his graduate studies at U.C. Irvine. The project sought to bring visibility to queer indigenous and Latino communities through the performative use of photography. The project took on the 19th century literary trope of the frontier novel as a way of foregrounding border issues. In addition to geographic borders, the project sought to look at the limits of race, culture, and gender by centering the series around Ramoncita, a "two-spirit" person of mixed racial heritage played, like all of the characters in the narrative, by Gonzales-Day. These missing histories, performed before the camera, or incorporated in the fictional text of the novel, give visibility to alternative gender models that existed throughout the Americas prior to contact with the west. Sebastião Salgado - Other AmericasFrom 1977 to the early 1980s, renowned documentary photographer Sebastião Salgado (b. Brazil, 1944) traveled across Latin America from Brazil to Mexico through Chile, Bolivia, Ecuador, and Guatemala documenting culture and struggle in what was to become his major body of work, Other Americas. These images pre-date those of the Serra Pelada Gold Miners (1986) which put Salgado on the map of international photojournalists. That series was followed by his celebrated and widely exhibited Workers, Migrations, and Genesis. Still working today on photographic projects of unrivaled global scale, this intimate exhibition will showcase a rare portfolio of 20 of the most important images from Salgado’s early Latin American series. Building Material: Process and Form in Brazilian ArtBuilding Material: Process and Form in Brazilian Art, features works by three generations of artists, emphasizing affinities between the materials, processes, and forms they have embraced since the Concrete and Neo-Concrete movements of the 1950s and 1960s. Building Material takes as its point of departure the work of pioneering artist, photographer, and industrial designer Geraldo de Barros (1923 – 1998), a central figure in the evolution of Brazilian art from mid-20th century onward. From his participation in the first Bienal de São Paulo in 1951, de Barros interpreted and reworked tenets of the European avant-garde to achieve a uniquely Brazilian abstraction that reflected the dynamism of a new modern society. Building Material explores the ways in which his innovations have found echoes and responses in the work of artists from subsequent generations: Rodrigo Cass, Ivens Machado, Paulo Monteiro, Nuno Ramos, Celso Renato, Lucas Simões, and Erika Verzutti. What does photography tell us about the human condition? Is there something about photography that can’t be achieved through other media? Why do artists choose to use it as the vehicle for their ideas? Why should we care about it, support it, collect it? The question of whether photography qualified as a fine art was settled long ago, but questions persist about the role of fine-art photography in an image-soaked culture. No medium has experienced such extraordinary technological change. From the earliest daguerrotypes to the handheld revolution to digital to the iPhone, photography has been constantly reinvented. How do we think about photography now? Should we still care about the classics? Will fine-art photography be relevant to the next generation? Through a series of conversations with individuals who are dedicated to the field, we will explore the questions that artists, collectors and museums are facing. I look forward to a robust discussion – please join in!